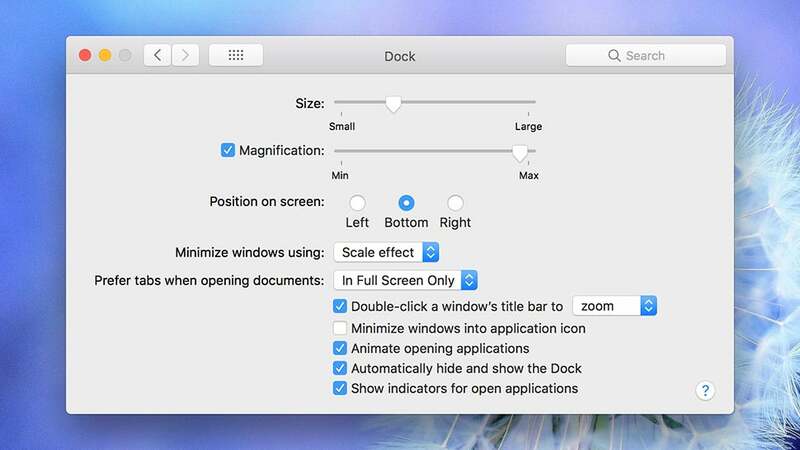 Your Dock or Start menu is your way into macOS and Windows, respectively, as well as everything running on top of them. So it makes sense to have these launch systems configured in exactly the way you need them to be. We've got a bunch of essential tips on streamlining your Dock or Start menu, and powering through your computing more efficiently. If you're a macOS user then the Dock is your way into applications, files, and the web, although you do have other options - like Spotlight search, which can be pulled up on screen with a Ctrl+Space keyboard shortcut and can find things after you type in what you're looking for. But if Spotlight doesn't appeal, or you prefer a more click-based way of navigating your computer than you need to make sure your Dock is in the most natural place for you. From the Apple menu choose System Preferences and then Dock to make changes: You can position the Dock to the left, the right, or the bottom of the screen, as well as adjust its size and the level of the magnification effect (as the cursor moves over it) via the sliders at the top. As far as streamlining the Dock goes, we'd say the Automatically hide and show the Dock option is a good one to keep ticked, which means the Dock stays out of the way when you don't need it. To add an item to the Dock, open it then Ctrl+click its icon, and choose Options then enable Keep in Dock; to remove something, repeat the process but disable the setting. To see all the open windows from a particular app (like the Finder or your web browser), Ctrl+click on the app's icon, then pick Show All Windows. By the way, that Ctrl+click shortcut can reveal links within apps as well — like the option to create a new window in a web browser, for example, or links directly to the various screens in System Preferences. Something you might not do, but should, is keep some file and folder shortcuts down in the Dock. 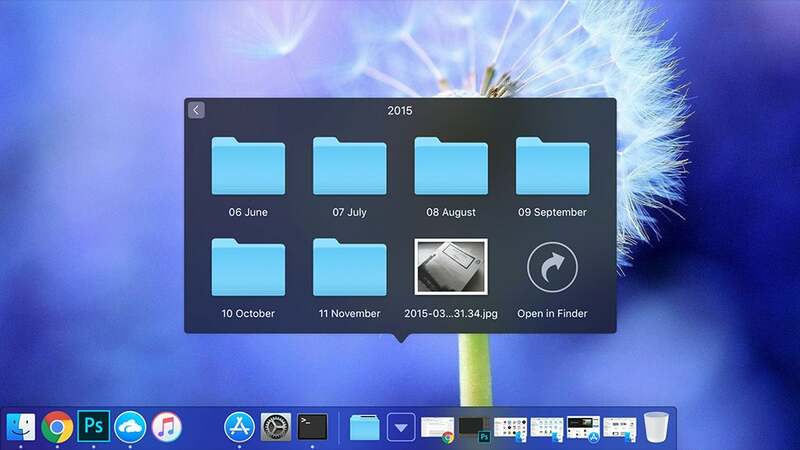 Drag any file or folder down to the right-hand side of the Dock from Finder to anchor it - if you've got a folder you access a lot, this gives you quick access to both it and its subfolders. Drag a file or folder out of the Dock to remove it. You can save website shortcuts in the Dock as well, if you find it helpful. Click and drag the URL from the address bar in your browser of choice down to the right-hand side of the Dock to add it; click and drag it out again to remove it. Keyboard shortcuts can make working with the Dock easier and faster: Use Ctrl+Cmd+D to show or hide the Dock, irrespective of the setting you've applied in the System Preferences pane. Cmd+Tab, meanwhile, lets you jump between apps without using the Dock at all. Hit Enter. Now type killall Dock and hit Enter again. 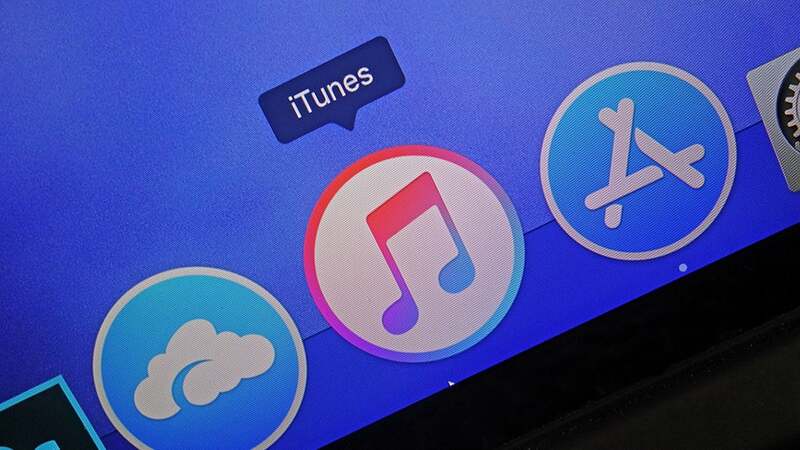 This will restart the Dock application. When it's restarted there should be a blank space on the dock that you can drag and drop to your preferred location. Repeat the command to add extra ones. Finally another Terminal command that you might find comes in handy. Input defaults write com.apple.dock autohide-time-modifier -float 0 then hit Enter. Next repeat the killall Dock to restart the Dock application. This will nix the standard short pause between the Dock appearing on screen and hiding itself again. If you ever want the delay to return simply type: defaults delete com.apple.dock autohide-time-modifier. Hit Enter and then type killall Dock and hit Enter again. If you've always wondered what the Windows key on your keyboard does, hit it to open or close the Start menu. Here's another helpful tip you might not have discovered yet: Right-click on the Start menu logo to access shortcuts to various parts of the system, including the Task Manager and the Device Manager. 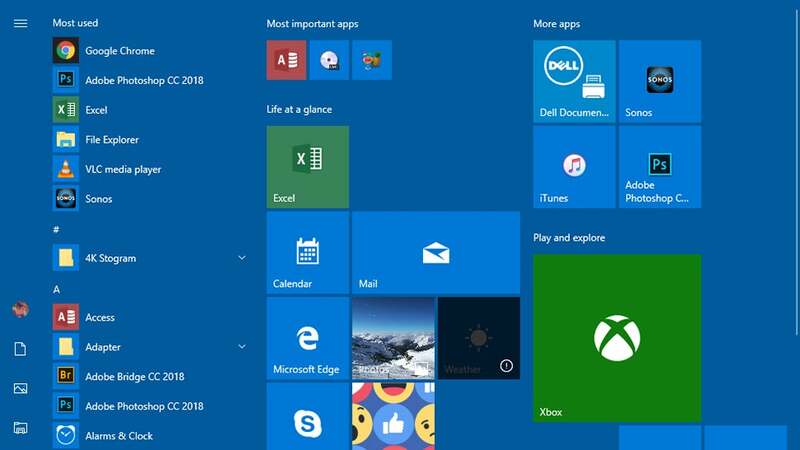 All of your installed applications are listed down the left of the Start menu — click to launch them, or right-click to uninstall them or pin them to the right-hand side of the launcher. To quickly navigate through your apps list, click on any of the letter headings to bring up a full alphabet. You can then click on any letter (or number) to jump to that section of the list. Remember as well, with the Start menu open, you can just start typing to look for a particular file, system setting, or application. Click and drag icons around on the pinned side of the Start menu to position them, or right-click and choose Unpin from Start to relegate them back to the main list. To create a group of shortcuts, drag one icon on top of another. On the same right-click menu you can choose a size for the pinned items: Small, Medium, Wide, or Large (though the options will vary depending on the program). If you drag icons up to the top of the menu or into gaps in the grid, you can create groups of app icons - click in the space above to name each group. Groups can then be moved by clicking and dragging on the three horizontal lines to the top right. Need more space? Open Settings by clicking the cog icon on the Start menu, then choose Personalisation and Start. Turn the Show more tiles on Start toggle switch to on to get more room on the menu, or even enable Use Start full screen for that vintage Windows 8 effect where the Start menu takes over the whole display. Various other options are available here too. You can hide the list of every installed app if you just want to focus on your favourites, as well as show or hide recently added apps and your most often used apps. Click Choose which folders appear on Start and you can show or hide certain folders in the panel on the left of the Start menu, like the Documents and Downloads folder. 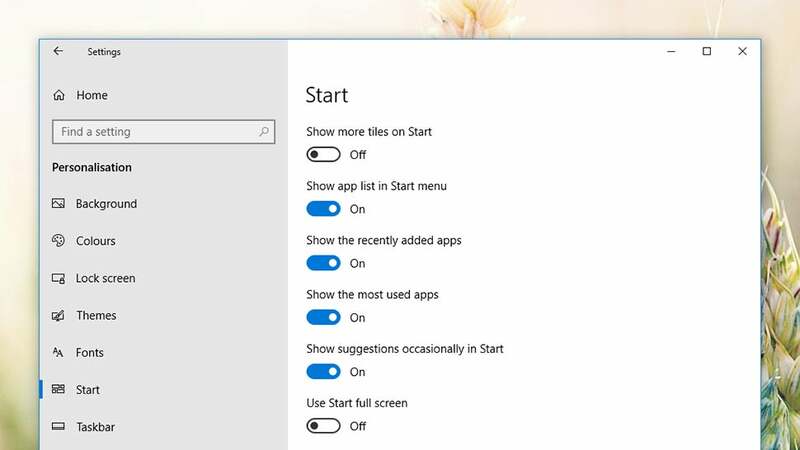 Of course if you're trying to streamline your Start menu you want to be turning off all of these options except for the ones you definitely need — the Start menu should load up a little faster and be easier to navigate as a result. You may well have folders you load up time and time again in File Explorer, and these too can be pinned to the Start menu for easy access. Just right-click on the folder thumbnail in File Explorer, then choose Pin to Start from the menu. Want to pin shortcuts to particular settings to the Start menu? This is possible too: Open up the Settings menu via the cog icon on the Start menu, then right-click on any heading or menu item and choose Pin to Start. Once you've confirmed your choice, these settings shortcuts can be resized and moved just like any other pinned item.